I'm gonna call it right now, this years SDCC will be a "TRUE Manga Colored" Goku in black & white. Or just solid gold and/or translucent. It's the last thing I would ever want, but I'm calling it. did you call arlian vegeta last year? They usually sell out within 30 min to an hour. 2) Wait until you receive an e-mail which designates the General Registration day for buying badges. 3) Sign onto their website on that day. Follow prompts to the "virtual waiting room/line"
4) You are "randomly placed" into a virtual line. You will just see a screen with a bunch of text and cute lil quotes they throw up. It automatically refreshes every two minutes. It doesn't matter whether you wait in the "line" for two hours or sign on two minutes before. They claim it's random. 6) IF you are selected, you'll get sent to another screen where you can buy up to three badges for whatever days are available. If you're in there early, you can get all four and preview night. If not, you might just be able to settle for one day at the very least. They sell out quick. Ouch. It's not that bad for NYCC is it? This is pretty much the same process for New York now. I swear, NYCC is getting worse by the year. 2014 NYCC had 151,000 attendees while SDCC has capped out at 130,000. There hasn't been a year that they haven't grown and are slowly taking over the entire Javits center (If not already have). I had to sit in a que for almost 2 hours to get my ticket (and was on there right when they started) and a few of my friends ended up having to go to a local comic shop when they got their allotment to get a ticket. They really need to find a way to improve the process. A black and white Goku...didn't Bandai do that before with their UFS line? Surely, they learned their lesson. If they did really nice shading and stuff, the black & white one would be kinda cool. Obviously I would prefer something more useful though. Yes the UFS line had b&w alternative "EXCLUSIVE!!!!" coloring for almost every figure in the line, and it seems like every company that produces anything related to Japanese cartoons has made gold, b&w, and transluscent figures and labeled them as exclusive/rare. I'm thinking Tamashii will resort to this due to a) Repainting the figures listed on this poll wouldn't stand out enough (other than possibly Trunks) to make them appealing to people who already own the originals. b) wanting to keep the highly sought after figures rare, thus raising the demand even further, and then at the peak releasing different versions as non-exclusive (besides Tamashii Web Shop) standard releases. well I don't know how you guessed that and if this year you're also correct then I'll be amazed. Anyhow, if done properly, a b&w goku would be awesome. They will definitely need to release more b&w characters after that though. Also a golden translucent only hair would be really nice. 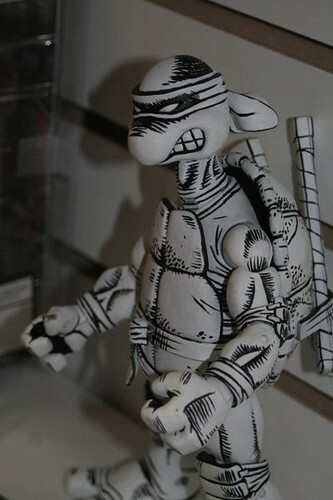 Anyways, NECA did black and white sketch variants of the original comic Ninja Turtles that turned out pretty cool. 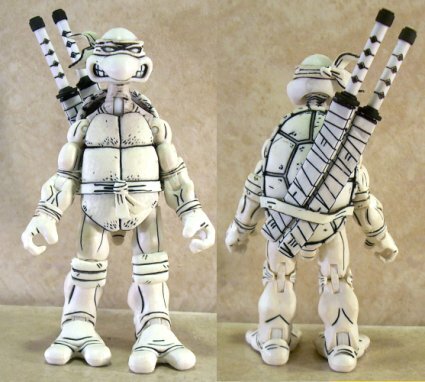 That TMNT sketch variant actually looks really nice, and if a SHF figure was painted like that I would probably buy it. 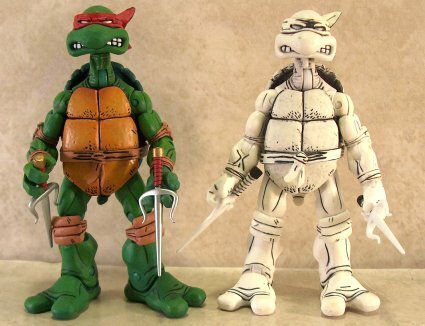 When I was imagining a b&w SDCC release, I was thinking it would look like the UFS repaints, which are ugly as hell. I also didn't notice that Kaioken Goku was on the poll, and now I'm thinking that one has the best chance of being the next SDCC exclusive. It would be a repaint that would really stand out from the original, and it would fit in well with Saiyan Saga Vegeta. Plus Toonami started airing DBZ Kai not too long ago and it's almost to the Saiyan invasion, and by the time SDCC comes around, they will probably be showing the end of the Saiyan Saga, which would leave Kaioken Goku fresh in people's minds, creating a larger demand for that repaint. -For those of you that are craving a SS3 Goku repaint, I think there will be a much better chance once Tamashii starts pumping out Buu arc figures or when the Buu arc of DBZ Kai begins airing outside of Japan. -Manga repaint Trunks still has a chance imo because there have been many successful releases of Trunks with the Manga colors recently such as the Master Stars Piece and Scultures. -SS Vegeta is just a pipe dream at this point. If they were going to do a repaint of him, they would've done it last year. The chances of Tamashii releasing the same character two years in a row seems slim to none, plus if they only painted his boot tips it would not be enough of a repaint to call it an exclusive. -Perfect Cell & SSGod Goku have the absolute lowest chance imo. Perfect Cell is technically anime colored. Although the green is not quite as bright as it should be, his skin color beneath the shell exterior is clearly purple (anime) and not blue (manga). As for SSGod Goku, that would require a complete retooling of the body and face sculpts, along with the repaint, in order to be accurate. Since Tamashii takes pride in being as closely accurate to the series as possible, it is highly unlikely that they would just repaint base Goku with red hair/eyebrows. So unless they decide to start retooling exclusives, I wouldn't hold my breath for a SSGod Goku at SDCC. I'm still willing to bet that there will be a B&W SDCC exclusive, but perhaps not this year since Kaioken Goku is on the list. Boddah. I really hope you're wrong about a blk&wht figure... Lol. Maybe once they're done giving us all what we want. Then the zebras can come out and play. If they release any other version of Vegeta from this period, it'll be the same mold as SSJ Vegeta we have now except with boot tips and they'll call it Cell Saga Vegeta. The only way I see them bulking him up is releasing him as a standalone Super Vegeta. I personally would prefer Super Vegeta. I feel that would get them to perhaps make Semi-Perfect Cell and maybe even Super Trunks to compliment him. I disagree with the manga versions (black and white) it just feels very cheap, black and white and/or some shading, thats it... It sounds kinda cheap and stupid to me, I think manga versions of these characters would be useless. Also, considering the fact that you pay just a little more for SDCC figures, I think it would be horrible to have black and white sdcc's this year. So you all would be fine paying $150+ for a SDCC SSJ3 Goku repaint rather than getting a SDCC black & white sketch Goku for perhaps $70ish that your collection could probably do without?